Guest Post: A Vegetarian in Turkey. Guest post by Harsh Mehta. After reading about my vegetarian adventures in Turkey, Harsh asked me about all the Turkish vegetarian dishes I didn’t try, and left me craving to take my taste buds to Turkey again. Through this post, he attempts to tempt the vegetarians among you to plan that trip to Turkey and treat yourself to Yaprak Dolma, Testi Kebab, and Turkish Baklava, among other vegetarian delights. It was just another lunch with a client, a Japanese one at that. When I mentioned I was vegetarian, hands stopped half way to the mouths, jaws dropped, and three pairs of startled eyes fixated on me. I don’t blame them for wondering how people like me, who eat no meat, not even eggs, get by. We do, but as much as we love travelling, there are times we are terrified by the prospect of hunting for vegetarian food on our travels. Testi kebabs: Vegetable stew, rice and salad. A cracker of a dish from central Anatolia. The vegetables are slow-cooked in a sealed clay pot, and the resulting hot stew is accompanied by rice and salad. But the delight of the dish lies in the way it’s served – cracked open with a hammer in front of you! Definitely calls for a try, doesn’t it? Pottery kebab. Photo by Albertjyi. 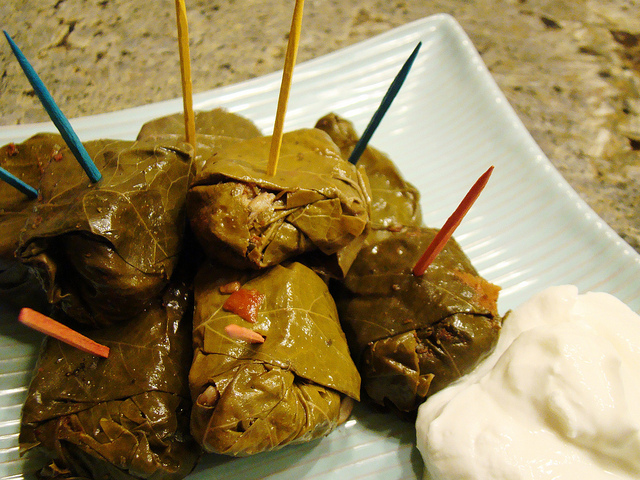 Yaprak Dolma: Stuffed grape leaves. Annia Ciezaldo in her book Day of Honey, calls the Dolma, a narrative dish, like short stories where each ingredient speaks as the package unfolds. Dolmas are usually vegetarian, with a stuffing of rice inside grape leaves; their non-vegetarian cousin is usually called Sarma. Other dolmas are primarily stuffed with vegetables. They make for an interesting change of taste, and for good conversation, as you take time opening each leaf and devouring the stuffing inside. After all, they are a narrative dish! Yaprak Dolma. Photo by Vegan Feast Catering. Head to the far eastern city of Van, which is said to have its own distinguished breakfast culture. There, and elsewhere in Turkey, breakfast is an elaborate affair, an occasion for the family to sit together and eat. With different varieties of cheese (including peynir), olives (both black and green), kaymak (Turkey’s version of clotted cream), cacik (similar to raita), the ubiquitous cay (Turkish tea), bread, honey, salads, fruits and even dry fruits, the Turkish breakfast will ensure that you have a hearty start to your day. Depending on where you eat, your Kahvalti may consist of some meat items as well. It is a good idea to specify Ben bir vejetaryen (Turkish for “I am vegetarian” or Tavuk, et ve balik yemem (Turkish for “I do not eat chicken, meat & fish”). Beware though, saying yemek instead of yemem would mean ‘I eat’! Turkish Breakfast. Photo by Pocket Culture. These were discovered in the lovely little village of Goreme, where the inviting alfresco seating at Fat Boys Cafe caught the attention of the terribly hungry lads that we were. A scrumptious burger with a patty of lentils, adorned with onions and other veggies, this is sheer Turkish vegetarian delight. And the Lentil Soup, as the name suggests, is delicious to the extent of being almost identical to the Indian Dal. When in doubt at a Turkish eat out, just order a bowl of Lentil Soup and some rice, and you’ll never miss home again! Red Lentil and bulgur Soup, with dried mint and chili pepper. Photo by LWY. Let history draw you to the city of Gaziantep in southeastern Turkey, where the sweet Turkish Baklava is said to have its origins. Even today, it is said that the Baklava of Gaziantep is impossible to make anywhere else, thanks to the weather conditions and the nuts found there; not that the Baklava in any other part of Turkey is short of amazing. Layers of filo pastry, with nuts stuffed in each, dripping with honey, ready to melt in your mouth. Baklava, for any food lover, is a journey in time and space alike, with its varieties – Turkish, Syrian, Iranian, Lebanese and even Greek – and the claims laid by different middle eastern countries to its origin. Yes, it is that important! Though there are several chains in Istanbul selling them, eat Baklava at one of the smaller outlets in the other Turkish towns. They are equally delicious and cheaper. (Heck, everything is, outside Istanbul). Turkish Baklava. Photo by Alaskan Dude. I didn’t know until I visited Turkey, that so many varieties of sweets that I thought were Indian, existed outside India as well. For example, at a bus station in Kayseri, we were amazed to find Talumba Tatlisi, a long lost cousin of the Indian Jalebi. Halwa, Kemal Pasha and Seker Pare have their Turkish siblings too, ensuring you have a sweet end to every meal in Turkey. Don’t forget to carry some of these sweets home to tell your folks that the Turkish Mutfagi took good care of your taste buds! Lokum aka Turkish delight. Photo by Tania Sheko. About the author: Harsh is your 20-something blogger who works and resides in Mumbai, and dreams of travelling to everywhere else on the planet. He has been to a few countries across two continents till now, and believes that the best destinations are not the ones that you go to with a wishlist but those that you return from with one. He blogs at TravelByts and tweets @harshM09. What vegetarian delight would you most like to try in Turkey? Join The Shooting Star on Facebook and Twitter for more travel stories from around the world. To write a guest post for The Shooting Star travel blog, please email me at shivyanath@gmail.com. Love the blog 🙂 Keep it up! Look forward to seeing some more great posts!! Hey Michael, its good to know that you too have been putting efforts in exploring local vegetarian cuisines. I had an eye opener when I went to Turkey. Shivya, on the other hand, has written elaborately about vegetarian food at other destinations too. I really am surprised at the variety of Anatolian cuisine but how few people in the U.S. (especially my home state of Florida) know about this top-notch culinary powerhouse. In Turkey I have one rule: Stay very active (run, hike, rock climbing, swim, bike) or gain 10kg. Completely agree! 🙂 I went with a few friends to the place and all the guys were of the same opinion.. you may end up eating a lot! Hi, Nice blog. Keep u the good work. Previous PostPraying At a Mosque: My First Time. Next PostKoh Mak Island: Of Hidden Beaches, Broken Boats and Beer.